how to maintain / remove your tan + get a free product from loving tan! These are the three things you must do before applying tan, to receive the best results. Make sure you exfoliate off any old sunless tanner you may have on, and shave to help the tan adhere better to your skin. Next your going to need to grab a body lotion and apply it to the areas that the tan tends to stick to. So that would be around your ankles, knees, wrists, feet, and hands. Also be sure that you are 100% dry before applying your tan. I also blow dry my hair before application because sometimes your wet hair can drip onto your tan, and it will instantly ruin it. For this step you want to go in and apply your tanner - with a tanning mit - and then let dry. I sleep overnight in mine and then shower the color guard off the next morning. PRO TIP - when you rinse the tanner off the next morning, do NOT use body wash. The soap will damage your color and wont allow for a long lasting tan. Maintaining your tan is cruicle to how long it will last. Your color could last any where from a few days, to over a week depending on how well you take care of it. You want to maintain it by using a moisturizing body lotion, but one that isn't oily. Oil will break up the tan quicker so stay away from anything with lot of oil in it. I tend to just use the normal bath and body works kind and have never seen a problem with it. Also be sure to stay away from exfoliater whilst your tan is on and pat dry your skin after showering. But I have a solution ! All you need to do is dampen the glove and then apply a bit of baby oil, then using circle motions scrub the skin & you will instantly start to see the tan flake off! It works like a dream!! The baby oil helps break up the tan and also helps to leave the skin soft and moisturized after the scrubbing. 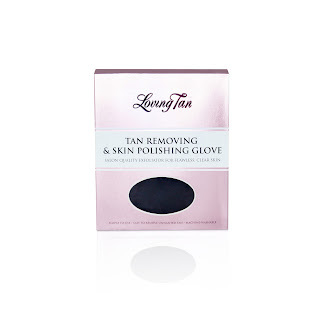 You can actually get the exfoliating glove by Loving Tan for free! All you have to do is enter code "savvy" for the free gift with any purchase of a tanning mousse! Such a great deal considering it generally costs $29 on there site! !